In chapter eight of Mark's Gospel, Simon Peter has offered his decisive declaration of faith to Jesus' question, "Who do you say that I am?" Jesus then begins to instruct them on what it means for him to be the "the Messiah" that Peter affirms. It doesn't look anything like they were taught as children in their religious instruction. To be the Messiah involves suffering, rejection, and death. But along with this there is an odd reference to some kind of glorification-- raised life after three days. What could this mean? Surely, God would raise the righteous some day, but resurrection before the resurrection of the dead was a strange and difficult claim to understand. One wonders if the disciples could even ponder resurrection since it was likely impossible to get past the idea that the culmination of Jesus' mission was suffering, rejection, and death. That was not in the job description of the Messiah they had known. Many things made those two ancient prophets great. For one thing, in the Bible each shares a moment of striking intimacy with God, through Moses' face-to-face chats with God and his glimpse of God's backside (Exodus 33:7-23) and Elijah's encounter with God in a strange "sound of sheer silence" (1 Kings 19:11-13). When one is so close to God, everything changes. Impossibilities dissolve. After all, some Jews believed that both of these prophets successfully avoided death and were assumed directly into heaven, as recorded about Elijah in scripture (2 Kings 2:1-12) and as the first-century Jewish author Josephus reports about Moses (Ant. 4.323-26). When one is so close to God, everything does change and Peter wants to preserve this moment of glory forever. "Rabbi, it is good for us to be here; let us make three dwellings, one for you, one for Moses, and one for Elijah." He was in such terrified awe he had no idea what he was saying. But one thing is certain-- here was a moment to be shared, to be proclaimed. If Jesus is in conversation with two of Israel's most important prophets then how can one fail keep this divinely glorious moment to oneself? 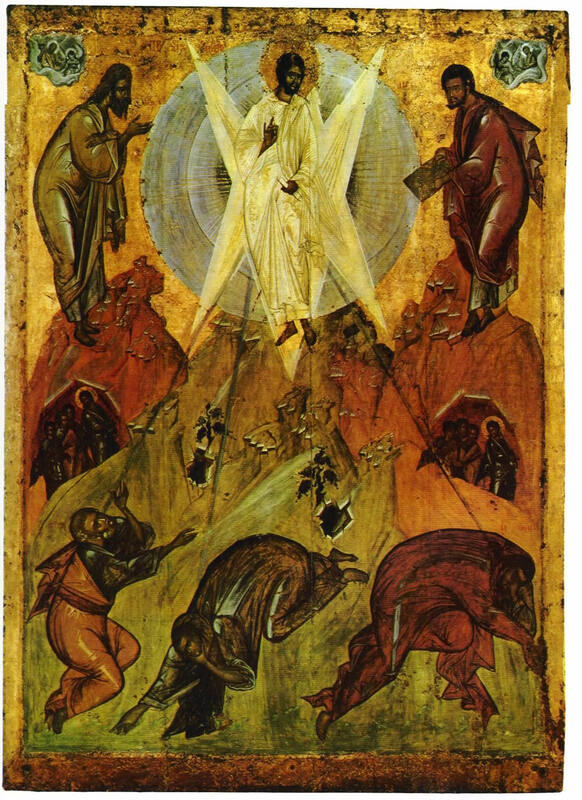 Coming down the mountain Jesus puts the kibosh on any thought of telling others what the three disciples have witnessed. "He ordered them to tell no one about what they had seen, until after the Son of Man had risen from the dead. So they kept the matter to themselves, questioning what this rising from the dead could mean." Just as Jesus instructed the disciples to tell no one he was the Messiah, now he tells them to keep to themselves this glimpse of glory they have experienced. How odd to keep such amazing happenings quiet. But some things can only be revealed at the proper time. Jesus does not tell them to be be silent forever. There will come a time very shortly when Jesus' resurrected glory will propel the disciples outward into the world proclaiming the Good News with such passion and determination that no one will be able to silence them. But for now they must remain silent on the glimpse of glory they have experienced. Perhaps the reason for this is revealed in Peter's response on the mountain. We are told he did not know what he was saying. Maybe to speak on these Transfiguring moments too soon will be to misspeak about them? Maybe the disciples need the light of the resurrection and the wisdom of the Holy Spirit in order to understand what they have experienced? If Peter does not understand what he is preaching, how can his hearers understand what he is saying? But for now the inner circle of the disciples must be silent... they must be silent and ponder what has happened.